2.0L FA20 motor is a common venture of Subaru and Toyota (4U-GSE). FA20 was employed for Subaru BRZ coupe car while Toyota utilized 4U-GSE for Toyota 86 and Scion FR-S. This motor is built on a framework of FB20. It features an absolutely restyled bottom. Fresh crankshaft, rods and pistons were employed. The motor has a square shape, having identical bore and stroke sizes and reaching 1:1 bore/stroke proportions. In comparison with FB20, compression index is bigger and equals to 12.5:1. Intake and exhaust camshafts feature AVCS system. Toyota contributed its direct fuel injection system D4S. Steel 4-2-1 exhaust manifold was utilized for exhaust system. Besides, it is available in FA20D version, a 2.0L naturally aspirated non-turbo motor with output of 200 hp at 7,000 rpm and a torque of 151 lb-ft.
FA20DIT, FA20F and FA20E are turbo versions of FA20 used as alternatives to EJ205 and EJ207. 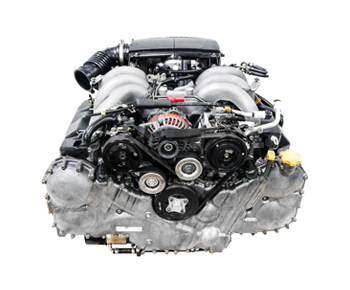 These models have aluminum pistons with lower compression index of 10.6:1, restyled heads, contributing to better airflow, and advanced combustion chambers. Camshafts of these turbocharged motors have additional functions and contain plastic intake manifold with tumbler generator valves. Twin Scroll turbocharger Garrett MGT2259S generates 1.1 bar pressure (1.5 bar in over-boost mode). Output is 272 hp at 5,600 rpm and a torque of 258 ft-lb. Rough idling. The most possible reason is malfunction of engine control unit software. It’s advised to get fresh software for control unit. Motor stops to function. You need to examine cam gear. Its improper functioning decreases pressure of engine oil. To increase durability and efficiency of FA20 motor, it’s necessary to use only high quality fuel as it influences engine’s lifespan. Besides, it’s advisable to buy only good quality engine oil and change it more often than Subaru recommends.